DAGUPAN CITY, Pangasinan - A five-year-old girl tragically died after being hit by an assassin’s bullet intended for grandfather Maximo Garcia, a drug suspect who earlier surrendered to the police. Danica May, the youngest fatality in President Rodrigo Duterte’s war on illegal drugs, was hit by a bullet in the head and later died in the hospital. After being informed that he was on a drug watch list, Garcia surrendered to the police on Saturday, August 21. Three days after he turned himself to authorities, an unidentified gunman opened fire on Garcia in his house at Barangay Mayombo at 12:30 p.m. Although Garcia survived the ordeal and is currently recuperating from a bullet wound in his stomach, his granddaughter Danica unfortunately became the collateral damage. According to a report by Inquirer, Garcia was a tricycle driver until he had a stroke three years ago. He and his wife Gemma run a small eatery in front of their house which was provided by the Department of Social Welfare and Development in the flood-probe barangay. Danica was attending kindergarten at East Central Elementary School. Her 29-year-old mother has been separated from her husband. “I would miss the nights when Danica would massage us until we fell asleep. 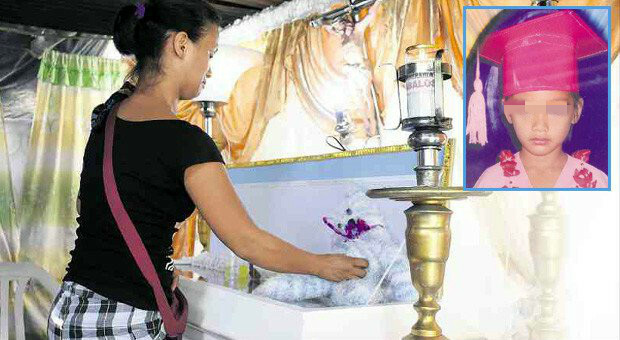 I would miss her laughter when she teased her mother,” Gemma told Inquirer. Insisting that her husband has never been involved in illegal drugs, Gemma said that she was shocked to learn that Garcia was on the police drug watch. A barangay captain persuaded Garcia to surrender and clear his name. “We are afraid to stay here. But the problem is where will we go? The killers may come back for my husband,” Gemma said. Meanwhile, Dagupan police chief Supt. Neil Miro believes that drug dealers were responsible for the attack.